Is anyone after a nutritious and health restoring floor hamburger? 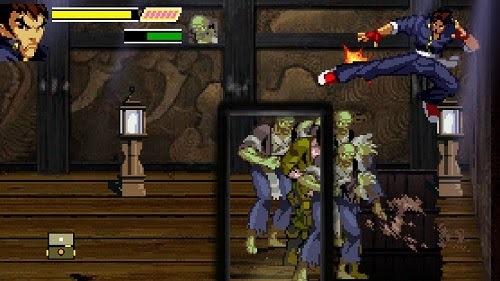 Punch and kick your way through hoards of the undead, now with a friend, in a re-release of the classic 2002 Gameboy Advance title, Gekido: Kintaro’s Revenge. Available digitally on Nintendo Switch priced at £13.49, it’s time to once again punch random objects to find some food to eat off the floor. Nintendo, and its newest console Switch, have come under criticism from the more vocal elements of its online community due to the companies’ silence over the omission of its staple “Virtual Console”. 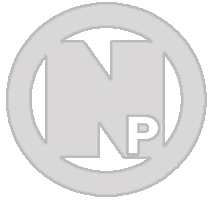 A back catalog of old Nintendo titles available digitally on the eShop and has been something present in most, if not all, of the consoles and handhelds from last few generations of Nintendo hardware. Some developers are not going to wait and have decided to take the reins and simply port over their existing older titles, giving players their recommended nostalgic gaming fix. 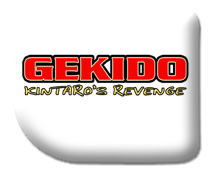 Naps Team have become the latest, bringing the hit 2002 Game Boy Advance title, Gekido: Kinatro’s Revenge to the Nintendo Switch, making improvements to it along the way. Gekido tells the story of Tetsuo, a disciple in the art of Shin-Ken. Sent to investigate strange happenings in a far-off village, Tetsuo soon discovers children of the village have been going missing and the dead are rising from the grave. With news that the old temple has been overrun with demons, it is up to him to restore peace and recover the missing children. The level design itself does show its age and is somewhat difficult to navigate. With no real handholding of any description to guide you through the non-linear levels, unnecessary backtracking often occurs, whittling down your life by forcing you to engage in unnecessary encounters. 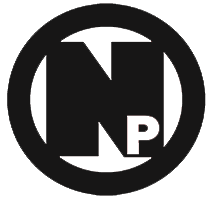 Unlike arcade titles of the past, Naps Team understands that it simply might not be possible to play through the entire story mode in one sitting so instead saves your progress between stages, allowing you to select the stage again from the main menu if you stop playing or die. The caveat to this is that you will only ever have the same amount of lives that you finished the previous stage with so practice to beat the early stages without losing man lives is critical in finishing the game. Besides the main story mode, there are also two new modes included in this re-release. The first, Relic Hunter Mode, is a procedurally generated dungeon that mixes up the level layout and enemy positions, tasking you with tracking down a relic with only one life. It’s recommended to play through the main game (where you have multiple lives) first to get a feel of enemies and their attack patterns as late level enemies can almost immediately appear in Relic Hunter Mode, causing you to waste a large chunk of life trying to figure out how to beat them. The second mode, Survival Mode, gives you a more traditional linear level requiring you to reach the far right of the stage to proceed to the next. You are only given one life to see how far you are able to progress. The game gives you a final score when you do finally die, unfortunately as there are no online Leaderboards bragging rights are limited to the person sitting directly next to you at the time. While containing graphical assets from the original release, the game also features toggleable re-worked and updated music and cut-scenes, as well as a 2 player co-operative mode that wasn’t present in the original. 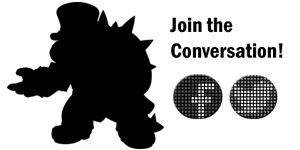 Scan Line filters have been included to replicate that CRT monitor effect and Antialiasing to smooth over some of the harder edges of the 2D artwork. With no difficulty select present in the game, all modes of Gekido are punishingly difficult. The game constantly throws you to the floor when you are either hit by an enemy, touch a floor trap or fail to make a platform jump. 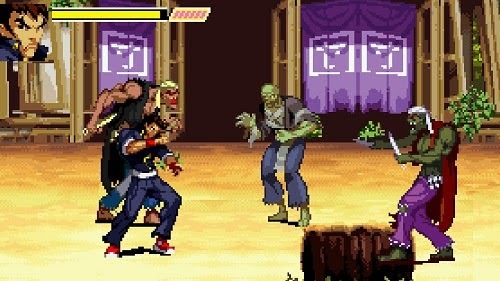 While this “knock to the floor” effect is prevalent in many beat'em-ups, few go to such an extreme as Gekido which can become frustrating when you are fighting large groups of enemies or in one of the games many platforming sections. An artwork gallery giving you a peek into some of the original 2002 concept art is also included, though the option to select individual pictures is not present; instead, the gallery is simply a slideshow, with button presses only allowing you to navigate to the next picture. Gekido is a fantastic throwback to a simpler time, providing a more streamlined title full of nonstop action that is gruelingly difficult to beat. Besides the ability to lose a large amount of life through cheap knockdowns during combat and while trying to jump across awkward platforming sections, the title does a wonderful job of reminding you that the Gameboy Advance had some truly fantastic gems during its lifetime. Let’s hope that Naps Team has chosen to release this title as a precursor to the continuation of the Gekido property as more of this style of title would be welcome on the Nintendo Switch. 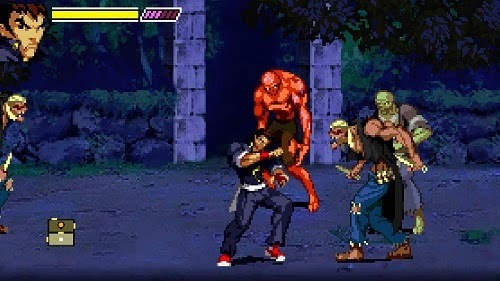 So if you enjoy a bit of arcade styled beat’em up action, make sure not to miss Gekido: Kintaro’s Revenge. + Entertaining co-op beat'em-up experience. + Relic Hunter mode adds tons of replayability. + Feels smooth and repsonsive in both Handheld and Docked. - The knockdown effect is frustrating. - Music is somewhat repetative.